Hi there, friends! Elizabeth, from Team Smiley, here to tell you all about the amazing time we had at Saint Sebastian’s Parish Festival in Ross Township. The weekend marked the beginning of many church festival appearances for the team, and you know what that means – rides, games, funnel cakes, and Smiley Cookies! It was Team Smiley’s first time attending this festival, and we were happy to be there! 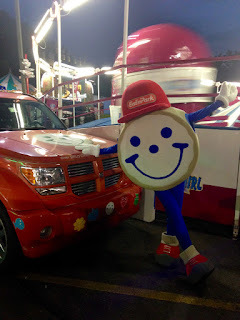 This fun-filled community event brought together Smiley Cookie lovers of all ages during the beautiful summer evening. The team encouraged both young and old attendees to try their hand at decorating their very own cookies, and we saw creativity in full force throughout the event! It was a very busy night for Smiley, too! In addition to meeting new friends, Smiley took selfies in the photo booth, hung out with Steely McBeam, and danced the night away with his fans. Stay updated on all Team Smiley events by following us (@enpteamsmiley) on Twitter and Instagram!